There’s a lot that’s easy about direct sales. It’s easy to get into (you can usually become a consultant for less than $200.00), it’s easy to learn how to do, and it’s generally easy to earn some money at if you have just a little knowledge. So how come so many people end up getting frustrated and cynical and quitting, often before they even give it a chance? I think it’s because of the common mistakes they make that virtually guarantee their failure. So, I thought I’d share some of what I think are the most common direct sales “fails” and how to fix them (or avoid them all together). Fail #1 – Getting off to a rocky start. This is really common and, frankly, it’s not completely your fault. The way our industry works, your sponsor is supposed to make sure you have the tools you need to succeed before you go out and start doing parties. Unfortunately, it’s quite possible that she doesn’t have the tools to succeed herself, so helping you do that is nearly impossible. How to fix it: Make sure you know the fundamentals around how to do a basic party, how to get bookings from that party, how to sell your products, and how to follow up with people before you do your first party. If you’re not getting that from your upline, go to her upline and work your way all the way up to your corporate office. Someone is going to help you eventually. Fail #2 – Not using the tools you’re given to succeed. 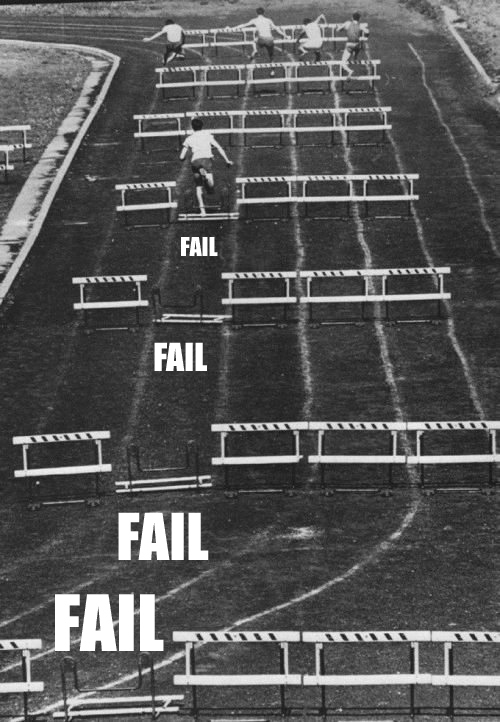 This one relates to Fail #1. How many of you honestly read the new representative training manual or go through the new representative online training completely before you started your business? I know from experience, not many of you. It’s understandable. You’re excited and ready to get going. But I can tell you from having worked with my corporate clients to create or re-write their manuals or rework their online training, they put lots of time and effort into making sure that training gives you exactly what you need to succeed. The same applies to ongoing training calls and material. If you’re not attending these calls or listening to the replays, you won’t get the results you want. How to fix it: Read your manual or use the online training tools (even if you’re not new) and attend as many training opportunities as you can. Fail #3 – Assuming your host will take your business as seriously as you do. This will never be the case. It’s your business and if you don’t nurture it, no one will. How to fix it: Stay in contact with your host prior to her party and send her invitations out for her at least 7 days prior to her party. Call and remind her about your host coaching appointment and to make follow up calls to her guests. If you don’t, she won’t. Fail #4 – Making your parties all about your products. Listen, your guests at your parties are smart. They’ve been around this direct sales block a few times and they know the drill. If you don’t do something to set yourself and your experience apart, you’ll be dealing with cynical, obligated people who are watching the clock and waiting to escape from the moment they walk into your party. How to fix it: Make the shift from product parties (where your only obvious goal is to leverage people to buy your products, book a party, or sign up to join your team) to parties that are all about the experience and focus on the fun! Remember, not one single guest is only there because of your products. They want to have a good time, and you’re the catalyst for that. Fail #5 – Neglecting your follow up duties. If you’re not following a consistent, intentional follow-up plan with your customers, potential hosts, and potential team members, it’s like letting beautifully ripe fruit wither and die on the vine. Just because someone doesn’t tell you yes the first time you ask doesn’t mean they never will. Most of the time a lack of interest means the timing isn’t right for them. How to fix it: Figure out what your follow up plan is, keep track of everyone using that system, and keep following up until they tell you to stop. That way, when the timing is right, you’ll be there, in front of them, with an easy way for them to say yes. There are lots more fails (and fixes) and I encounter them weekly over on the fan page. Not a fan yet? You should go like that page. I do a Q&A Monday every week and love to give specific advice based on your individual questions. So now I’m curious…what would you add to this list (along with your fix, if you have one)? Need some help filling up your calendar for 2016? Grab your complimentary copy of my “Book Yourself Solid In The Next 30 Days” roadmap. It’s yours for free when you subscribe to my mailing list. Already a member of the list? My system won’t add you twice, so go ahead and grab the roadmap anyhow. Click here to grab your roadmap now! WANT TO USE THIS ARTICLE IN PRINT OR ONLINE? Julie Anne Jones is a direct sales corporate consultant, coach, and trainer, and the CEO of Julie Anne Jones, Inc. She is known for her authentic and easy-to-use scripting and specializes in specific language and tools for success in direct sales. To learn more about Julie Anne and her products and services, and to read her weekly blog posts, visit her at www.julieannejones.com. If I’m Bugging You, I Want You to Go!